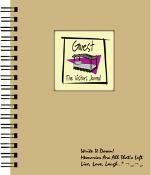 Dimensions : 7.5" x 9" inches Page Count : 200 This journal is a great way to help guests sign in and comment on their visit. Leading questions like, ? How was the weather,? ?Favorite Memories? and ?Places I would recommend? help your guests t think of what to write. It collects much more than just names and addresses?this book will become your most valuable possession in your home.